Having finished this game about a year ago, I was just going to leave it review-less because I didn't have much good things (or interesting things) to say about it. 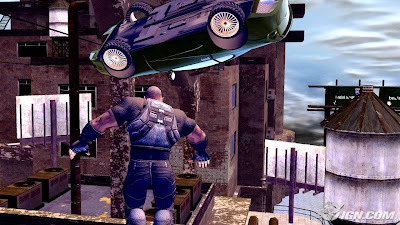 This week I finished Red Faction: Guerilla and I thought it would be folly on my part to not review Crackdown first since they are both very similar games. But whereas Red Faction brought a sense of joy in the destruction you created, Crackdown at best brought a feeling of disinterest. 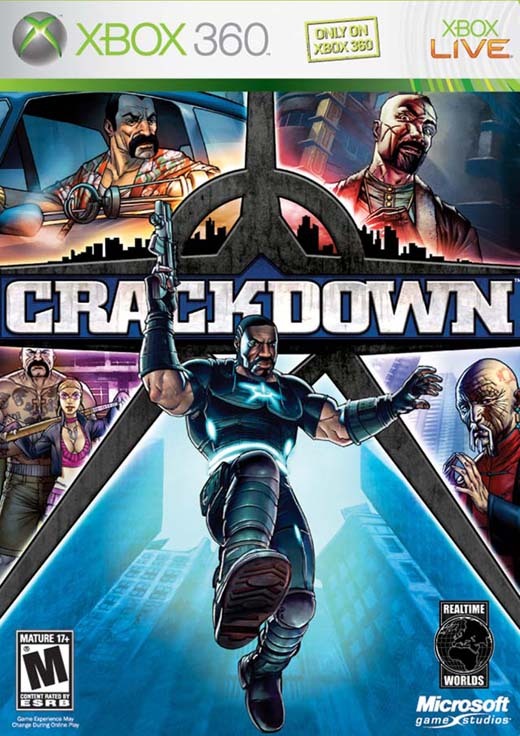 Crackdown is a sandbox game that places you in the distant future at a fictional city called Pacific City, and like any other game that's based in the future, the city is overrun by gangs and crime lords. You play as a futuristic cop imbued with superhuman strength and agility, where the strength helps you hit hard and lift heavy objects while the agility allows you to leap at great heights and run with great speed. As the top cop in the city, you're charged with taking down the 7 crime lords that own the city scattered in 3 boroughs. Take down the crime lords in each borough and that section of the town is considered liberated from enemy control. Free all 3 boroughs and consider victory yours. The missions you encounter really only take on three forms: assassinations, racing and obstacle courses. The assassination missions are what moves the game forward, pointing you at the next crime lord you could take down, should you choose that path. In addition to your agility and strength stats, you also have a driving stat and a weapons stat. Driving stats increase as you hit more bad guys with your car, or perform different stunt jumps. Your weapons stat increases as you shoot more bad guys, while your strength goes up when you melee more bad guys. Probably the funnest stat is the agility, which is boosted by collecting these green orbs scattered across the city. As you collect more, you'll be able to jump higher, leaping across buildings, which to me was the funnest part of the game. I think one of the main problems I had with the game was that it game was too easy. For each boss I never really deviated from the strategies that I used for the first boss: take out the henchmen surrounding a building, infiltrate the building, take down more henchmen, kick the boss to death. That;s it. The bosses were never tough either. Run up to them, give them 4 or 5 kicks and they're dead. It didn't make for a challenge and thus didn't engage me. The next problem was the lack of varied missions. As mentioned above, you only had three different kinds to go with, not adding much depth to the game. Thirdly was the lack of a story or narrative. Basically you run amok in the city and the police HQ will radio messages to you on who to hit next and that's the extent of the story. Radio messages and short video packages. And even after beating all the bosses, the game ends anti-climatically just as the game began. Like I said, nothing to engage you. The game sold well when it was released and I have no doubt that it was because it was packaged with a beta key for Halo 3 (before it was released). For some reason, the game garnered generally positive reviews with fans really backing it up. I got flamed on by the trolls on Kotaku for decrying the game as boring... them rabid fans I tell you. But there were a minority that agreed with my points. The sequel is coming out soon, so I guess those high sales warranted a follow-up. It'll be interesting to see how the game does, now that it doesn't come with a Halo beta key. So I guess in the end, it comes down to your preference. 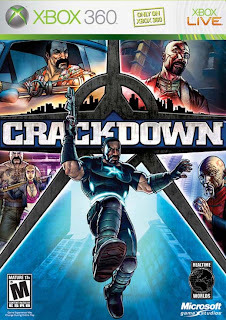 If you want a game that's mindless in its action and story, then perhaps Crackdown is for you. I think there's a right way and a wrong way to do this kind of a genre, and Crackdown unfortunately fell into the wrong way for me. Don't get me wrong, I enjoy this style of gaming. You'll see in my upcoming review of Red Faction, that even a game low on story can still be engaging. Well regardless of, you can find this game in the bargain bins at your local game emporium, so if you've got a few coins in your pocket I suppose its worth the few dollars (if it's going to cost you more than single digit dollars after tax, I say forget it!). Til next time, later geeks!